It's the weird period between Christmas and New Year's Eve where most of my diet is made up of sparkling wine, left over salmon, and cheese (plus I don't want to get too adventurous or virtuous in the kitchen just yet). I'm back in Scotland where it's wet and chilly and all I want to do is eat cosy food in front of a fire, watching endless episodes of Made in Chelsea. This tomato barley risotto is perfect for cold, lazy nights. It's much less hassle than normal risotto but just as warm and comforting. It's a really quick week night dinner but you can also make a big batch on Sunday and snack it on all week (which I often do). Dice onion and garlic. Heat butter in a large sauce pan on a medium high heat, add onion, then garlic. Sauté and add thyme leaves, paprika, coriander, chili flakes, oregano, and salt & pepper. Add pearl barley and stir everything together. Deglaze the pan with sherry and allow alcohol to burn off. Add tomatoes (then rinse the can with some water and add that too). 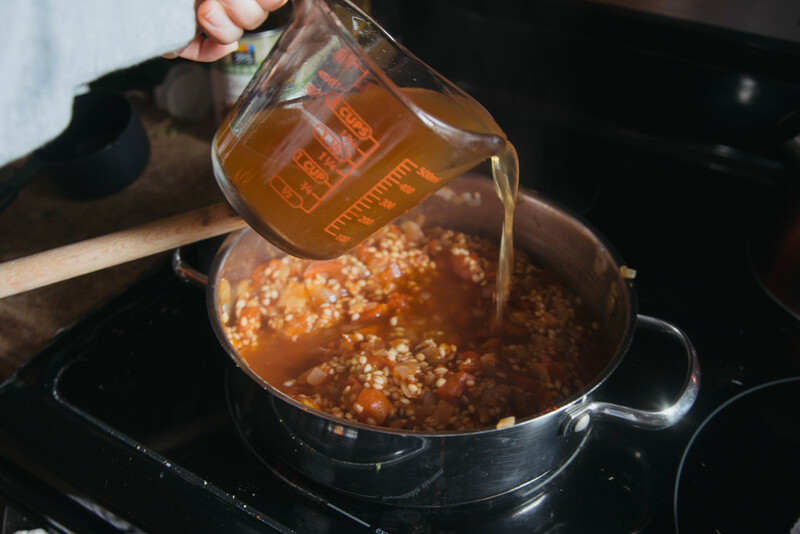 Add vegetable stock then reduce heat and simmer until the barley is cooked through (approx. 30 minutes). Stir constantly to stop the risotto sticking to the pan. Once cooked, remove from heat. Add lemon zest and juice, créme fraîche, and most of the parmesan. Taste and adjust seasoning. Spoon the risotto into bowls, garnish with a couple of thyme leaves and sprinkle with the rest of the parmesan.